Classic Core® is the industry’s leading name in combination (“combi”) core panel construction where cross bands of thin MDF are utilized in place of veneer cross bands in an otherwise domestic veneer core panel construction. This combination of MDF and veneer core provides a smoother, improved surface over softwood veneer core cross bands, reducing core telegraphing potential through the decorative wood face and back. Classic Core constructions are also lighter in weight and superior screw holding over composite cores of equivalent thickness. These smooth combination panels are ideal for applications including furniture, cabinetry and fixtures. Classic Core provides a smooth, sound surface with higher density than traditional veneer core. This reduces the potential for core telegraphing through decorative veneer overlays. Classic Core also significantly reduces finishing problems stemming from allowed open knot holes or open joints in standard veneer core constructions. Classic Core provides a smooth, sound surface with higher density than traditional veneer core. This reduces the potential for core telegraphing through decorative veneer overlays. Classic Core also significantly reduces finishing problems stemming from allowed open knot holes or open joints in veneer core cross band constructions allowed under the ANSI HP-1 voluntary decorative hardwood plywood standard. Classic Core panels have a thin MDF cross bands next to the face and back for projects that require a smoother face than typical veneer core panels. Classic Core panels have excellent machining properties. Classic Core panels can be specified as PureBond® and constructed with no added formaldehyde pMDI MDF cross bands. Standard thicknesses for Classic Core include 1/2″, 5/8″, 3/4″, 1″ and 1-1/4″. Classic Lam thickness offerings include 1/2″, 11/16″, 3/4″, 15/16″ and 1″. Ask us about our other thickness options if the thickness you require is not listed here. PureBond Classic Core and PureBond Classic Lam can be ordered through out mills upon request, subject to market availability of NAF (no added formaldehyde) thin pMDI MDF crossbands. When ordered as PureBond Classic Core, panels can contribute to LEED credit IEQ 4.4 calling for composite panel products with no added urea formaldehyde. 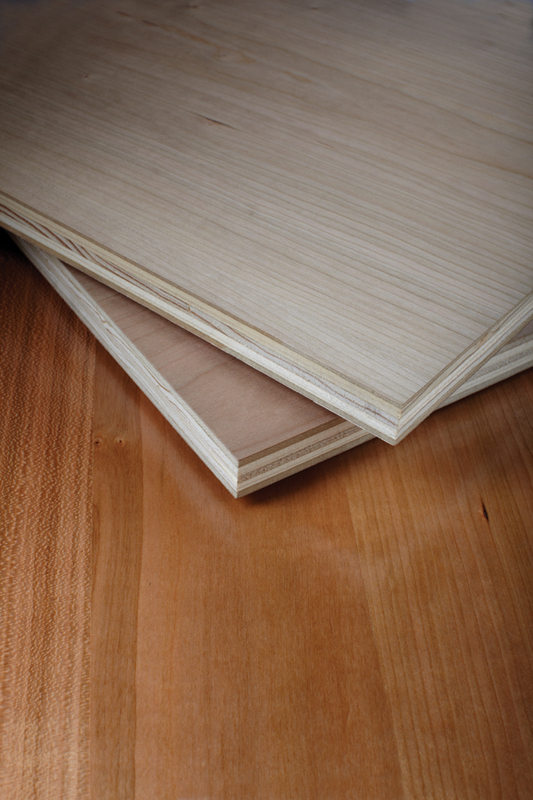 Classic Core and PureBond Classic Lam panels are also available as FSC® certified upon request. FSC certified panels contribute to the LEED MR 7.0 credit. *Test samples were constructed with rotary maple face and back. Test results for hardness can differ depending on density of decorative veneer. Wood is natural, thus physical properties including weight can vary. Test data is for informational purposes and does not represent a claim by Columbia that identical panel assemblies meet these properties in the field. Classic Core offers a construction of veneer core inner plies and MDF cross-bands. The panel thickness dictates the actual thickness of the MDF used in the construction. Although Classic Core still falls within the HPVA thickness tolerance of +0 / -3/64″, the engineered MDF cross bands provide more consistent thickness tolerances compared with single-step, all-veneer core construction. A construction upgrade is available where NAUF MDF crossbands are replaced with pMDI bonded MDF cross bands for a no-added formaldehyde construction. Classic Core with pMDI crossbands are sold under the PureBond® brand name. J Classic Core Core is constructed with a thin MDF crossband, thus this panel has an overall increased volume of veneer inner ply, weighing less than regular Classic Core referenced above. The thin composite lines in the profile of this panel, are thinner which is important in applications with an exposed edge. The “J” designation also means this platform is pre-sanded before face and back decorative veneers are applied. This is referred to as “two-step” construction, yielding tighter tolerances panel to panel. J Classic Core offers superior features in terms of strength, stability, weight, surface quality and thickness consistency. This platform fits the bill for end users that operate CNC equipment that requires tighter tolerances. For end users that need a core that is closer to a full 3/4″ Columbia offers a 19.5mm (.767) J Classic Core. A construction upgrade is available where NAUF MDF crossbands are replaced with pMDI bonded MDF cross bands for a no-added formaldehyde construction. Classic Core with pMDI crossbands are sold under the PureBond® brand name. Classic Lam is designed as a lamination blank where the same MDF and veneer innerply construction is provided without the decorative wood veneer overlays. Applications to consider for Classic Lam would include laminating, custom veneer lay-up and painted applications. Where even tighter tolerances are required, ask about our J Classic Lam options. A construction upgrade is available where NAUF MDF crossbands are replaced with pMDI bonded MDF cross bands for a no-added formaldehyde construction. Classic Core with pMDI crossbands are sold under the PureBond® brand name.